This is our traditional family birthday cake. I love it because it is chocolate (it's a law: birthday cakes must be chocolate), not too sweet (so I can justify giving it to kids and then finishing it off after bedtime), and easy to make (kids can help without driving me crazy). 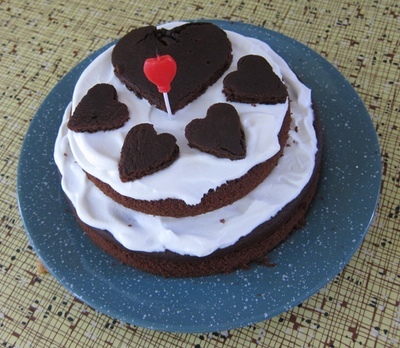 For this cake, we made a double batch and used three cake pans - a big one for the base, a medium one for the second tier, and a third one for the heart cut-outs to place on top for decoration. We put jam in the middle and whipped cream on top. Preheat oven to 350 degrees. In a mixing bowl add the ingredients one at a time, stirring after each. Pour into cake pan(s). Bake for 25-30 minutes.